In the preceding articles on qNMR we discussed the ways to ensure your NMR data will yield the most accurate peak integral data, and therefore the most accurate Purity determination. The final step now is to extract relevant integral data from the spectra, and calculate the purity. The calculation is simple and can be done using a pocket calculator! There are ways to simplify and make the process more robust, and I will briefly discuss an Mnova script that you may wish to use for the talk. Subscripts i and r relate to the test analyte and reference compound, respectively. AI is the absolute integral for a signal or set of signal, and NN in the corresponding number of nuclides. MW is the molecular weight (or, more correctly, the molar mass in g/mol), and M is the weighed mass of material (g). We therefore must know the equation terms shown in blue, and the terms in purple will be derived from the NMR data. From the spectrum, below, we need the purple terms in the equation for a minimum of one analyte multiplet. 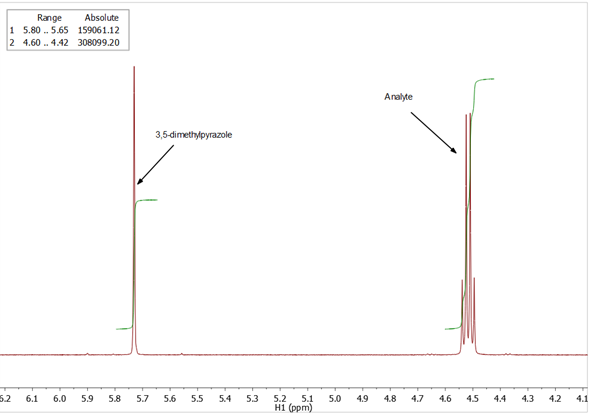 The reference material was 3,5-dimethylpyrazole (DMP), and shows a sharp singlet peak at 5.73ppm (in DMSO-d6) that corresponds to NN=1. The AIs for these are shown in the table. Ideally you would like to calculate this number using >1 solute multiplet in the spectrum, and perhaps take the average concentration value for these to achieve a better representation of the analyte purity. In this case duplicate samples were prepared, to improve the measurement. The measurement details including integral limits may be stored and recalled, to ensure the purity determination is done exactly the same way each time. Selecting the analyte multiplets to be used for the final purity is simplified. There is a useful reporting feature. Analysis of a duplicate of the exact same sample is simplified. The script is invoked after the spectrum is correctly phased, etc., but before integration. Zoom to show the multiplets you will be integrating. From the menu bar choose Scripts → NMR Tools → Purity Calculator… The values highlighted in yellow were entered manually, and information about our reference compound was in an associated file (that you can edit). Note the first button, which could have allowed the majority of these data to be automatically loaded from a file. Click the “OK” button, and you will be prompted first to integrate the signal for the reference standard, and then 1 or more multiplets from the analyte. After this is done we see a table resembling this. Note that the purity is shown for each analyte multiplet, and you must adjust the “Nuclide count” (NN) for each. You can also deselect a multiplet if it seems to give a poor result: uncheck the box to do this. We see that the purity based on the analyte quartet at ~4.5ppm is 97.51, which is very close to what we calculated manually. The other two multiplets indicate quite similar purity, although you might question the last one. Click the “OK” button, and the scripts ends, with the report written on the spectrum. We can speed up the process if we have performed the analysis for this compound previously, and wish to do it exactly the same next time. After performing the analysis once, click on “Save Parameters”, and write the file with a unique name. Next time you want to perform the analysis click on “Load parameters from file” on the first screen, and load the file. 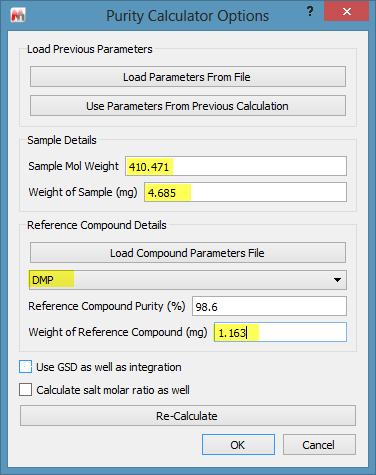 You only have to change the masses of materials then to replicate the Purity analysis. When doing replicates, you have a similar shortcut available after doing the first analysis. When looking at the second dataset, click on the “Use Parameters from Previous Calculation” button. This works similarly to saved parameters above: all you have to do now is fill in the correct masses for the second experiment and the analysis will be performed exactly the same as for the first. The last step of calculating compound purity is simple, and made simpler by an Mnova script. Vice President of R&D of Mestrelab Research S.L. Read his profile here.